I have been a new mom now for 7.5 weeks and every day is a new learning curve for myself. There are a few great posts I have in me, like wanting to be a super woman and my need for a routine and the wrench in that system (or more aptly to be named: “my infant won’t let me be a control freak), but today I really only have time to do something light and fun. I know E’s nap time is limited (this late in the day I will be lucky to get a solid 45 minutes) and I need to use it as best I can! So what I thought I would post is about my baby wearing must have items. I always knew that I wanted to be one of those women who wears their baby close to them, but I didn’t realize how much E and I would enjoy it! 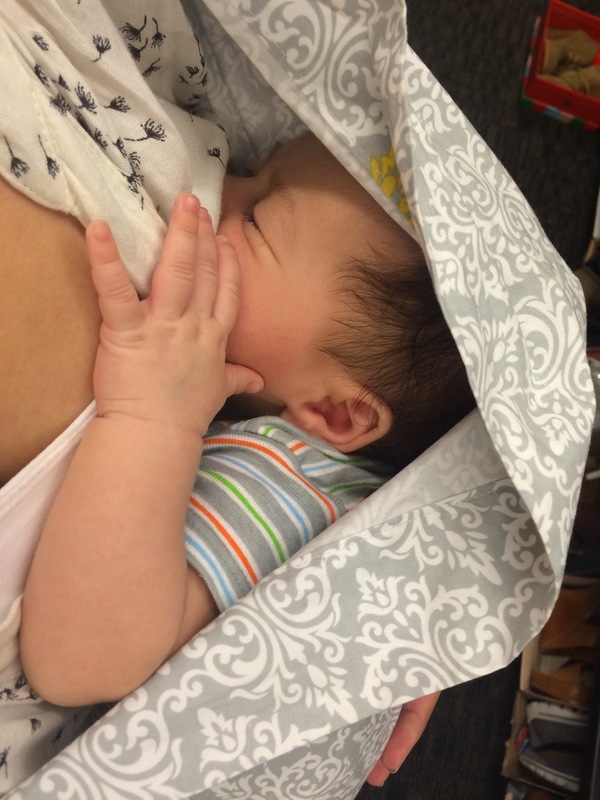 My post is about two baby wearing products and one nursing cover. I added the nursing cover because it has helped me be able to wear E out and about and feed him without worrying about exposing everyone to my breasts! The items I am about to tell you about are things that have worked wonders for little E and I in the last few weeks and I hope that if you are debating about any of these items, you may purchase a little more confidently based on what worked for us. No, he isn’t nursing, but he was prior to this photo. I am clearly covered here! I purchased a Seven Sling baby sling because I received a coupon for a “free sling” (I say free in quotes because you still have to pay for shipping and handling as well as a size insurance with this company). At the time I wasn’t sure if I was even going to use it because I was planning on getting a Moby wrap or K’Tan wrap. Well I never purchased either wrap because I wasn’t sure what size to get (I always want to size down in hopes of the baby weight gloriously melting away like butter in a hot pan). E was 3 weeks old when I finally busted this out. After a morning of colic crying I was at my wits end when my mom told me to put E in the sling. She said it would help him feel better being against my skin and hearing my heartbeat. Now I am not going to say it was a miracle worker, but it definitely helped to soothe him. When E is fussing from being tired, I just pop him in the sling and walk around with him and he slowly settles down and starts to nod off. It also allows me to be more mobile while still meeting his need of being nestled up against me. This has become such a favorite of mine I have ordered a second sling in black a size up because this one is a little too snug and I didn’t purchase the size insurance. OH and BONUS POINTS for the sling, I am able to use it while shopping and nursing! I was tired of being cooped up in the house like a prisoner so I put E in the car and went to Target. Of course according to Murphy’s law, as soon as we got into Target E was screaming and hungry. I started stressing out thinking where the heck can I sit in Target and feed this little guy? I had my sling with me so I popped him in the sling and then threw my Itzy Ritzy wrap over me so no one would get a peep show and went about my shopping. I was so proud of myself I texted a fellow breastfeeding mommy friend to share the news #winning !!!! There are so many nursing covers out there, I am sure you can’t really go wrong with any of them, but I personally am now an Itzy Ritzy mom! The thing I love about this nursing cover is that it covers so much of me and little E! Now I am not a woman to judge another mom for feeding their child how they want, breast out, whatever, that is just not for me. I have always been someone who is on the more prudish/conservative side of the spectrum and my biggest concern with breastfeeding was how I was going to be able to do that without feeling exposed. A very close friend bought me this wrap off my registry and I was so happy about it! Itzy Ritzy has the cutest prints for their wraps so you can double them to be used as a scarf for your outfit. 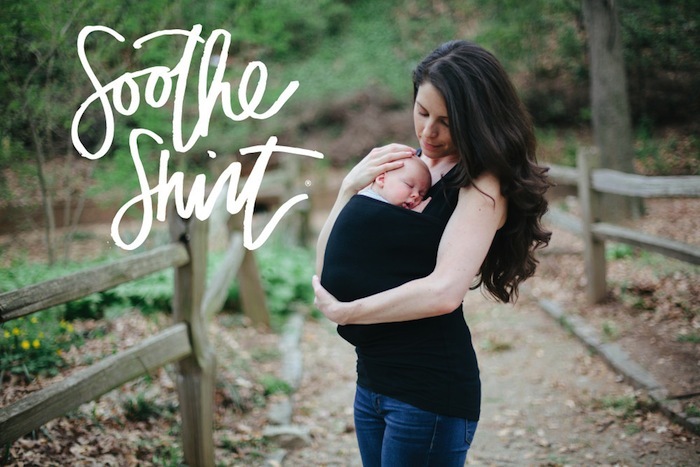 The other thing is the cotton material is light and breathable for when you have your little one underneath nursing. Seeing as I am living in Southern California in the middle of a very hot summer, it is important to have something that won’t smother E. Lastly, the wrap is so large when spread out in use, I feel securely covered. I was able to put this wrap over my Seven sling while shopping and never had to worry about a nip slip! It really can’t get any better than that….or can it? I want to buy like 3 more in different prints but my husband might thin I am being a little too excessive. I haven’t been able to snag a picture of me and E using this shirt because it is always dirty from how often we use it! This is one of the most expensive items I spent money on in terms of baby wearing. I honestly wasn’t even going to buy it because of the price, but we had extra money left from the shower so I splurged on this top. Now I want to find a way to save some more and get at least a second one so I don’t have to be constantly washing mine! So why do I love this item so much? It is AWESOME because it allows me to wear E like I would in a sling without the need to carry anything extra! I use this top when we are going out for the evening and I am trying to compartmentalize the diaper bag. Our first outing as a family took us to an outdoor crawfish festival one night. I wore my Lalabu shirt with a maxi skirt. When E started to get fussy I just popped him in the kangaroo pouch and rocked and walked with him. He settled down for a little while and enjoyed the scene. The other thing I like about this shirt is that it fits more on the snug side. Any postpartum mom can tell you that your stomach is not rock hard after giving birth (well mine was never rock hard to begin with but now it definitely isn’t!!!!) and this shirt helps hold that loose stomach in place. It made me feel good about how I looked in it. I actually always receive compliments when I wear this! My next big adventure with my soothe shirt is to wear it to church and see how E does. I have a feeling it will work out great! Baby wearing may not be for everyone, but I will say that it has worked for us. E is a little guy that really needs to feel close to you and snuggled and I love that I have so many options to accomplish this. Sure the nursing wrap isn’t really for baby wearing it, but it works hand in hand for me because it allows me to travel freely without stressing about being able to feed E.
As I am finishing re-reading this post for grammatical errors E has woken up from his nap. I am watching him on the monitor to see when he starts screaming. Hopefully soon I will have more time to post about my other adventures we have had recently!